The Government’s Chief Medical Officer has praised the UK pig sector for the progress it has made in reducing antibiotic usage but has stressed the job is still only ‘half done’. 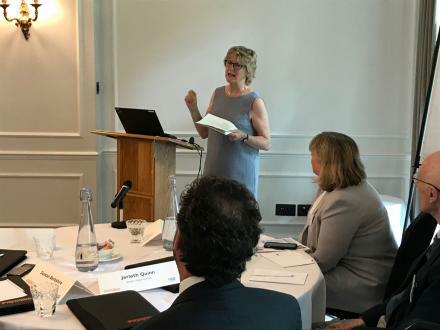 Dame Sally Davies was speaking at an industry roundtable event in London, organised by AHDB in conjunction with Pig World, exploring the future of veterinary medicine and antibiotics in pig farming. With Chief Veterinary Officer Christine Middlemiss also in attendance, Dame Sally highlighted the Government’s One Health approach to antimicrobial resistance (AMR) and stressed the global nature of the problem. “I am proud of how well you are doing with antibiotics. I am here because we are talking One Health. Christine and I are joined at the hip about how we work on this and what we do together,” she said. “Let me be quite clear – the problem is biggest in human use and misuse of antibiotics. I recognise that and I am not into blaming our animal sector. Dame Sally, who has previously warned of a ‘post-antibiotic apocalypse’ if the issue of AMR is not properly addressed, explained that One Health was about ensuring ‘we all work together’ to ensure antibiotics are used appropriately in humans, pets and livestock. “We are all in this together,” she said. The event, held at the Farmers Club on Monday and also attended by the NPA senior policy Georgina Crayford, who chaired a break out session, followed the recent publication of figures showing that antibiotic usage in the pig sector, at 131mg/PCU in 2017, has more than halved over the past two years. Use of Critically Important Antibiotics having virtually ceased altogether. Dame Sally welcomed the reductions seen across the farming industry and highlighted the ‘key role’ played by RUMA, which through its target task forces, led by veterinary and producer representatives, has set voluntary targets for each sector. Referring to progress made in the pig sector, she praised the partnership approach, incorporating vets, producers, other parts of the industry and Government, that has driven the reductions. “You have halved antibiotic use in two years – we are aiming by 2020 to hit 99mg/PCU and we are well on the way. You are also reducing high priority critically important antibiotics, which is very important. And you have done this voluntarily,” she said. She predicted the task would become more difficult, but said the industry had the momentum to continuing making reductions. She also suggested that the human medical sector, which she acknowledged had not made as much progress as she would have hoped, could learn some lessons from the livestock sector, including the data recording achieved through the pig sector’s electronic medicines book (eMB-Pigs). “I can’t thank you enough. We are making progress and I am proud of that, but we need to keep going – it is a job half done, there is further to go,” Dame Sally said. Full and extensive coverage of the Industry Roundtable event will appear in a special AHDB/Pig World Antibiotic Supplement with the August issue of Pig World.